I want to start off with "It’s been a busy week" again, but I’ve said or thought it so many times that it’s become redundant. I doubt that I’m really going to have an easy week at any point in the next decade. I used to think that it would be cool if I had more projects demanding my attention than time. And what do you know, I’ve got it. And I don’t think it’s a case of “be careful what you wish for”: It’s much better to have too much to do than too little. I can always (if I get my priorities straight) drop a project. And at the moment, the ideas for projects are coming faster than I can polish them into stories. I’ve got the outlines of five short stories in various stages between “completely in my head” and “halfway written”. And I’m revising my novel so I can show it to people when I go to World Fantasy Con. I’ve been planning a couple of novels in a couple of franchises that I’d like to take a crack at, in addition to mapping out my second solo effort. But while I’m not going to fall back on the old standard and say that this week has been busy, I must admit it has been a full of emotional peaks and dips. I finished a very difficult essay and sent it off to the editor, who liked it (yay!). When I proposed the topic for my next essay, I found that it was already taken (boo!). My novel has been read by a professional that I like very much, and she likes my work (HUGE YAY!). I did not get into the Nyarlathotep anthology edited by Peter Worthy (booo! ), but I did get into the Cross-Genre Cthulhu anthology (Yay!). The positives of this week far outweigh the negatives. For example, on Wednesday, I gave blood and walked two miles home. However, I didn’t have to walk the additional mile and a half to pick up the car. And yet, I found myself feeling kind of down and listless as I came home from work today and sitting down to face work on the blogs. And it’s not just because I’m a pint low. I know myself enough to understand that no rejection is ever not going to affect me. It hurts that Peter didn’t think that my story was strong enough to be in the Nyarlathotep anthology. I’m sure that it will be an excellent anthology, and I’m definitely going to buy it when it comes out, but my initial reaction is rather different. But I’m not going to rant and rave about it. While I’m not going to deny my hurt, neither am I going to wallow in it. I made a lot of progress toward my personal goals this week, and the rejection is just a temporary setback. If the story is as good as I think it is, it’s going to sell somewhere. It’s just a matter of finding the right fit at the right price. I’m aiming for better-paying markets than I was a year ago, so I’m going to have to accept that I’m going to get rejected more often. I just have to accept that there’s an appropriate mourning period when I get over myself, which will likely involve writing all my pain into a blog entry. And tomorrow, I’ll pick myself up and see what other venues are looking for my sort of story. At the same time, I can’t rush it. I have missed what would have been a good opportunity because I was in too much of a rush to get a story published. I wanted to get it out there and read by someone–anyone–and I let it go to the first person that said yes. And that cost me the opportunity to sell it to a much more interesting venue that doesn’t take reprints. I see that my last entry was in July. It’s been a busy month and a half. So, what have I been doing instead of posting to my blog? Let’s start with the first week of August. 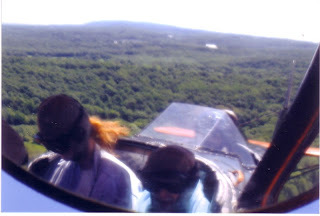 I took a lovely biplane ride with my in-laws. The Old Rhinebeck Aerodrome remains a great place, and as far as I can tell the only place locally, to get a biplane ride. The modern experience of flight really insulated the flier from the experience: the flier sits in a sealed cabin, and the heights and speeds involved are quickly so out of the normal human range that what you see is fairly abstract. In a biplane, with the wind in your hair, flight is very different. You can reach out and feel the air rushing past you, the overwhelming roar of the engine is less than ten feet in front of you. We couldn’t have been more then fifteen hundred feet in the air, and everything is still quite recognizable–houses, trees, cars, even people. And the Hudson River Valley is beautiful as it spreads out below you like a beautiful tapestry of trees. This flight was rather different from the one I took two years ago. The pilot did a tight 360 on a wingtip. Last time, we circled rather lazily. The difference might have been that I tipped the pilot in advance this time. Later, I went to Silent Hill with friends Shinankoku, Mrs. Shinankoku, and the Queen of Science. Oh it wasn’t quite what you’ve seen. But consider this, we went up Mount Equinox, and into the clouds. When we got to the top, it was every bit as foggy as the video games (the pictures are still in the camera), with thick tendrils of mist within ten feet of you, and absolutely no visibility past thirty feet. Seriously—you couldn’t even see across the parking lot. And it was quiet. No sound other than us and the chill, damp wind blowing through the scrubby pines. When we the last time you were somewhere that you were the only noise around? No music, no cars, just your footfalls, the sigh of the wind in the skeletal pines, and anything you say that isn’t immediately swallowed by the omnipresent mist. Adding to the creepy was the fact that there is an abandoned hotel on the mountaintop. It’s sort of a cheesy 70's place, pre-fab, and clearly has seen better days. But it’s not altogether abandoned, apparently, because there was a light on in back. Sometimes you come across the tiny shards of a story. I always wonder about the rest it—where it started, and how it will change in the future. Later, we went to a ProjektFest in New Haven. I can safely say that the Gothic Music festival is the loudest thing I have ever been to, and that includes sitting than six feet away from an airplane engine. And I saw perhaps the most exquisitely beautiful woman I have ever seen in the flesh. No, I don’t’ have any pictures of her. We got to see Voltaire and Niki Jane live (I want to learn to play the musical saw). Niki Jane was awesome, but Voltaire was definitely the highlight of the show, since he was funny, energetic, and with an excellent rapport with the audience. He and all of his band were dressed to the nines in some absolutely beautiful Edwardian outfits. And really, I would think that was enough. But it wasn’t. I also finished the first draft of my novel on the 11th. Let me say that again, I FINISHED THE FIRST DRAFT OF MY FIRST SOLO NOVEL! And I did it because I worked hard for most of August, when I wasn’t flying, or visiting frighteningly quiet mountain tops, or having my ears assaulted by industrial music, and through the beginning of September. And if that weren’t enough, I spread my wings a little and redesigned the main page of qusoor.com. Before September is over, I will have written an essay on William Peter Blatty’s comedies, and starting in October I’ll be revising the novel, hopefully so I can interest someone in it at World Fantasy Con, which is the first week of November. So the reason I haven’t been posting on my blog is because I’ve been working my frikkin’ tail off.